With this in mind, we looked at LinkedIn data to understand the prevalence of these “social alchemists” with liberal arts degrees joining the tech workforce. We defined “liberal arts” as the humanities, social sciences, natural/physical sciences, and theoretical math. As our data shows, liberal arts grads are joining the tech workforce more rapidly than technical grads. Between 2010 and 2013, the growth of liberal arts majors entering the technology industry from undergrad outpaced that of computer science and engineering majors by 10%. Internet or software companies are especially popular—38% of all recent liberal arts grads in tech currently work in this space. Given these growing trends, we looked into the data and uncovered three insights that can help liberal arts grads understand where their expertise fits within the technology industry. These days you find liberal arts grads all across the technology industry. 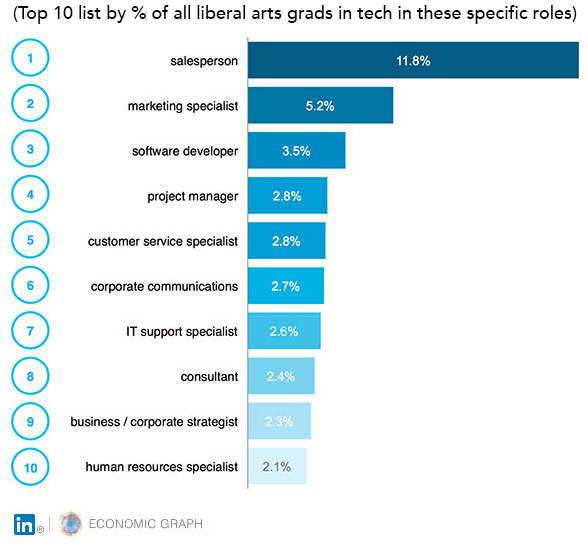 While sales and marketing still make up the majority of liberal arts degree holders in tech, the third most popular role for recent liberal arts grads is within software development. These results reveal that the philosophy behind liberal arts, which encourages diversity of skills and flexible critical thinking, transfers to the workplace in various forms. Where you went to college plays a part in whether your liberal arts degree lands you a job in tech. On average, about 10% of all recent liberal arts grads go into tech directly from undergrad; but for students graduating from the top 20 schools in America—the average is 14%. However, you don’t need to attend an Ivy League school to make your liberal arts degree work for you in the long run. 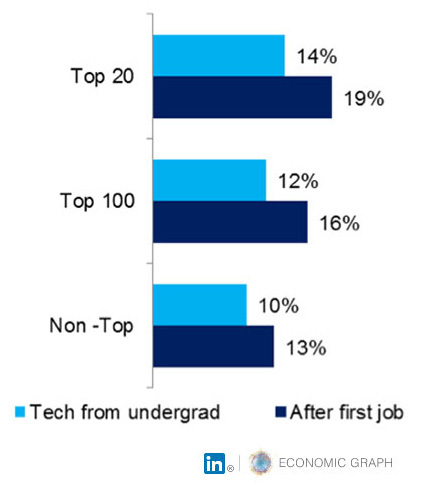 When we broke down the percent of recent liberal arts grads currently in tech by top 20, top 100 (those not included in the top 20), and non-top 100 schools, we found that the difference between each tier is about 1% or less. Having full-time work experience gives liberal arts grads a better shot of finding a tech job, irrespective of industry. An earlier Economic Graph analysis shows that half of the top 10 industries hiring outside of their industry are tech-related. Compared to liberal arts majors directly from college, the average percent of liberal arts grads going into tech after having just one other job is already 4% higher. While we still see slight difference with pedigree, the overall picture is brighter for all liberal arts majors with experience. In our modern work economy, people have more opportunities and resources to get the job they want; what matters the most is what people do to get those jobs. With LinkedIn you can gain new skills, search for and apply to jobs and make new connections. As we continue to build the Economic Graph, we will be keeping a close eye on education and job trends as they signal the changing nature of careers. Knowing the connections between our education and job opportunities can help us understand the choices we make in our own careers. Methodological Details: The results of this analysis represent only LinkedIn data. As such, how members choose to use this site can influence our results, as well as our accessibility to data. These variances were not accounted for in the analysis. When we refer to “recent grads”, we mean liberal arts majors that graduated between 2010 and 2013 and do not have graduate degrees or technical double majors. When considering schools, the top 20 schools included the top 20 national universities from U.S. News as well as the top 20 liberal arts colleges. The top 100 schools included the other 80 national universities at the top, as well as the remainder of the top 50 liberal arts colleges. All other schools were considered “non-top 100”. Majors considered liberal arts were in the humanities, natural and physical sciences, social sciences, and theoretical mathematics. Please note that because we looked at all schools in the U.S., there will naturally be more non-top 100 schools represented when we look at overall data, i.e. the 10% of all recent liberal arts grads going into tech is similar to the 10% of all recent liberal arts grads from a non-top 100 school that go into tech. The job type, i.e. salesperson, is dependent on how LinkedIn categorizes the role. A “job” is also anything the member chooses to include as a position on their profile. The members that make up this data graduated between 2010 and 2013 from a U.S. school, and we assumed June to be the graduation date of that year (unless otherwise noted). Members without education data were excluded from the analysis. Jobs considered tech included internet, computer software, computer hardware, biotechnology, online media, e-learning, computer games, consumer electronics, computer and network security, information technology & services, nanotechnology, wireless, and medical devices.